Analyses of literature data about processes for solution utilization formed after desulfation of the active mass of scrap lead-acid batteries is performed. 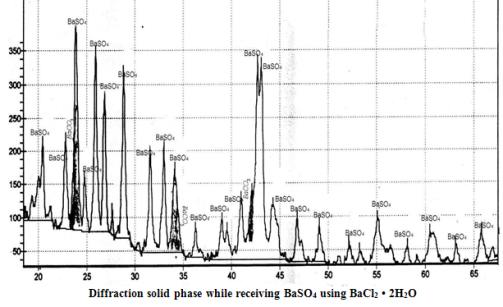 Optimal conditions for obtaining of barium sulfate sediment from ammonium sulfate solute and chemically pure Ba(OH)2×8H2O и BaCl2×2H2O were found experimentally. In laboratory the commercial barium sulfate from sulfate solutions, that are waste of recycling process of battery scrap, with application of chloride and barium hydroxide was production. The possibility of using this product were discussed. battery scrap; active mass; desulfation; barium sulfate; barium chloride; barium hydroxide. Reagents. Potassium sulphate. Specifications. GOST (State standard) 4145-74. IPK Izdatelstvo standartov, 1974, 14 p.
Morachevsky, A. G. Actual problems of disposal of scrap lead-acid batteries. Zhurnal Prikladnoi Khimii, 2003, 76, no. 9, p. 1467-1475. Morachevsky, A. G. Vaysgant, Z. I., Ugolkov, V. L., Habachev, M. N., Bochagins, E. V., Kalko, O. A., Kuznecova, Yu. S. Regenerative processes in the processing of active masses of scrap lead-acid batteries. Zhurnal Prikladnoi Khimii, 2006, 79, no. 2, p. 242-250. Morachevsky, A. G., Vaysgant, Z. I., Korelyakov, A. V. Ecological problems of collection and recycling of secondary lead materials. Zhurnal Prikladnoi Khimii, 2000, 73, no. 7, p. 1125-1130. Morachevsky, A. G. Physico-chemical and technological research desulfation process of lead materials. Zhurnal Prikladnoi Khimii, 1998, 71, no. 6, p. 881-890. Morachevsky, A. G. Physico-chemistry of lead recycling process, SPb: Bulletin of SPbPU, 2009, 270 p.
Kalko, O. A., Kuznecova, Yu. S., Kunina, N. V. Recycling solutions after desulfation active masses of scrap lead-acid batteries. Bezopasnost' zhiznedejatel'nosti, 2011, no. 5, p.44-48. Kogan, M. S. Recycling sulphate-oxide fraction scrap lead-acid batteries in the conditions of small-scale industries. Ph.D. thesis, St. Petersburg, 1994, 14 p.
Morachevsky, A. G., Vaysgant, Z. I., Kalko, O. A., Klebanov E. B., Novikova, N. Yu. Recycling solutions after desulfation of lead materials sodium hydroxide. Zhurnal Prikladnoi Khimii, 1997, 70, no. 1, p. 167-168. Morachevsky, A. G., Kogan, M. S., Demidov, A. I., Vaysgant, Z. I. About regeneration of solutions of sodium hydroxide after desulfation of lead materials. Zhurnal Prikladnoi Khimii. 1993, 66, no. 9, p. 2101-2103. Hegay, L.D. Lead accumulators: condition, problems, decisions, Vladivostok: Dalnauka, 2005, 256 p.
Potassium sulfate. Technical conditions (TU) 2184-093-43499406-01.